Mr. Ntja holds a Bachelor of Engineering in the field of Civil Engineering obtained from University of Roorkee (UP) India in 1982 and Master of Engineering in Civil Engineering from University of Witwatersrand in 2000. He has a wide experience in engineering, project and general management. He started his career as an Assistant Engineer in the Department of Rural Water Supply and grew to a status of Regional Engineer in the southern districts of Lesotho. He has a wide experience in water supply in rural communities from his work in the Department from 1982 – 1988. He has designed and constructed several water supply systems ranging from gravity, diesel, electrical and solar pumping systems. Mr. Ntja has also worked as Senior Engineer and Head of Appropriate Section of Ministry of Interior and Rural Development as well as Senior Water Engineer of Ministry of Water, Energy and Mining for Maseru Town. Thus he gained a wealth of experience in appropriate technologies including indigenous fuel, solar energy and water abstraction, treatment and distribution in a fast growing town from 1989- 1990. 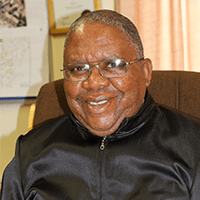 He was then appointed as Director of Works and Maintenance of the University from 1991 to date, with a mandate to develop, construct, maintain and manage many buildings and Infrastructure for the National University of Lesotho. Works and Maintenance Department is one of the oldest University Departments formed in 1940’s. It is a service arm for infrastructure facilities, repairs and provision of various services to NUL Community. Provision of cleaning services (Upkeep of grounds at all campuses).